CARACAS, WILLEMSTAD - Venezuelan oil minister Eulogio Del Pino voiced optimism Thursday about his crisis-hit country’s ability to increase its oil production to 3 million b/d, depending on a hoped-for price recovery. Speaking to reporters ahead of an OPEC meeting, Del Pino said Venezuela had produced 2.8 million b/d in May — well above some independent estimates. He played down the significance of Venezuela having to import crude oil amid an economic and political crisis that has seen parts of the domestic industry shut down, partly because power cuts have affected facilities such as refineries, and the lifting of heavy oil. On oil markets, Venezuela has long sought a more interventionist approach by OPEC to support prices, an ambition that has largely gone ignored by key members of the group. Del Pino said it was to be expected that a company such as state-owned PDVSA, with overseas refining assets on the island of Curaçao and a US subsidiary, Citgo, would need to import crude, angrily rebutting suggestions to the contrary from reporters. “That is something that has been created. For example we have Citgo — we are buying crude oil from different producers… We have a refinery in the Caribbean in Curaçao — we are bringing oil for that refinery,” he said. For political reasons some parties, which he did not specify, were “trying to create a sensation that hey Venezuela is not producing,” he said. “What is the big deal? 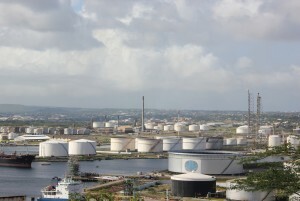 For a refinery in Curaçao we are buying oil in the market,” he said.